Some 3,000 workers at Ford Motor's (F) truck plant in Dearborn, Mich., have been idled because of a shortage of parts needed to manufacture engines installed in the company's popular line of pickup trucks. The workers will be on temporary layoff for about a week, The Detroit News reported. The plant manufactures the popular F-150 pickup truck, but a parts shortage has affected the availability of two types of V-6 engines, both of which are manufactured at Ford's engine plant in Cleveland. 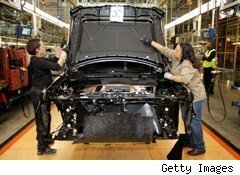 Company policy forbids Ford from naming the parts-supplier, Ford spokesman Todd Nissen told the newspaper. But Nissen noted that the problem was caused by lack of capacity, not a quality issue. About 3,000 hourly and salaried workers on three shifts are off the job at the Dearborn plant until Monday, the spokesman said. The engines account for two of the four choices available in the F-150, one of the most popular vehicles sold in the U.S. and a source of healthy profits for Ford. While on layoff, the workers will receive unemployment benefits, with Ford contributing an amount that raises wages up to about 95% of the employees' take-home pay, according to the News.